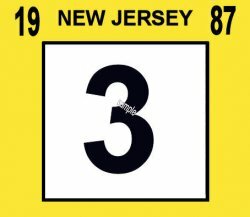 1987 New Jersey inspection sticker - $20.00 : Bob Hoyts Classic Inspection Stickers, Add a Final Touch to your Restoration! This 1987 NJ reproduction Inspection sticker was taken from an original and beautifully restored.using our patented "Peel and Stick" feature that allows you to attach it to your inside windshield excatly like the original. Buyer can choose a custom month from (Jan to Dec) for an additional $5.00. Buyer will recieve a random month unless a specific month is ordered.